I'm interrupting the singles posts to give you guys this fantastic album! A lot of people have heard Bill Cosby's album entitled "Hooray For The Salvation Army Band" but not too many people know about his first album. 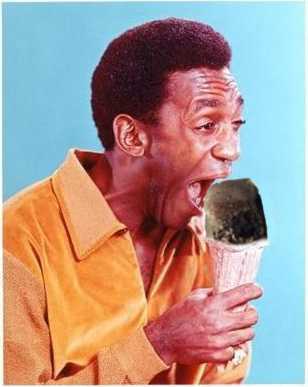 "Silver Throat: Bill Cosby Sings" came out in 1967 at the height of Cosby's "I-SPY" fame! The back cover proclaims that it is a "rocking soul album" but the first side features a more country flavor with covers of three Jimmy Reed songs. The most surprising thing of all is that Cosby had a hit his first time out of the gate. He took Stevie Wonder's "‘Uptight" and reconfigured it with a new (funny) lyric and got himself a top 40 hit in September of 1967. I present it for you now in it's original pristine stereo sound! Singles Collection Episode 1: Well Mr. Jaws . . . I'm starting to sort through my various boxes of singles and in doing so, I've realized how much I love listening to them all over again. As a result, I plan on posting a lot of different ones over the next few posts. The first installment is one of my all time favorite records as a kid. Dickie Goodman's "Mr. Jaws". Long before "musicians" were taking parts of other people's records and adding their own lyrics to them, Dickie Goodman took that first step towards sampling, remixing, and symbolic juxtaposition. He was the first performer to use fragments of other people's hits to build his own chartbusters. Whether it was a Martian with Little Richard's voice, a President copping lyrics from an Alice Cooper track, or a shark with a taste for the Bee Gees, Goodman's "snippet" records became popular Top 40 radio movies. Along the way, he battled rival publishers, record producers, copycats and America's changing musical tastes to become one of the most successful and distinctive novelty acts in the rock era. Where's the Dartman? In this video!!!! Here's Joan Jett's newest video! And guess what? I'm in it. I'm the guy in the crowd in the blue shirt that is bobbing his head from left to right. You can pick me out if you look really close. ENJOY!!!! !